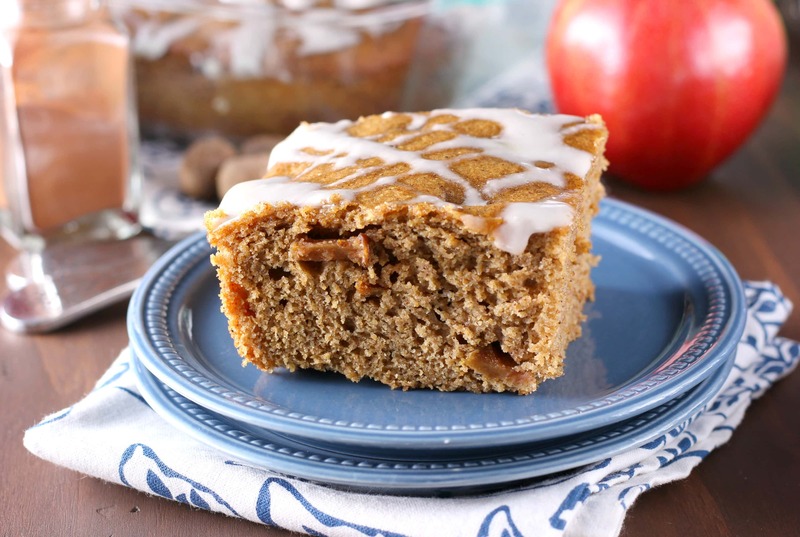 This Brown Butter Apple Yogurt Snack Cake recipe is made with white whole wheat flour and maple syrup! All of the spices of apple pie combine with nutty brown butter to create a new fall favorite! *Recipe and text from 09/26/12. Images updated 08/29/17. 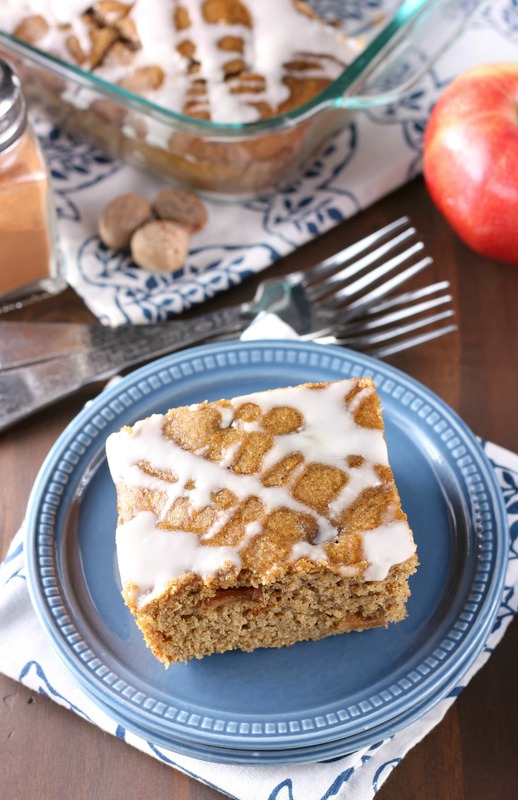 Perfect for using up those fresh, fall apples, this snack cake is loaded with flavor from apples and spices without being loaded with fat and sugar. In fact, this cake is made with pure maple syrup, white whole wheat flour, and yogurt. That means you can eat it for breakfast, snack, and dessert! Okay, so there is some butter. Brown butter, that is. Slightly nutty and a great addition to just about any baked good. This cake is no exception! All of the spices that you expect to find in an apple pie combine with chopped apples and brown butter to create a new fall favorite. The texture is more like that of a quick bread, and the moisture from the yogurt makes it easy to eat with minimal crumbs. Perfect for rushing out the door on busy mornings! Or, if you prefer a more leisurely way of eating it, trying heating it up and putting a dollop of homemade whipped cream on it! Either way, this cake has fall written all over it, and your house will be filled with the most amazing smells while it bakes! The nuttiness from the brown butter, the sweetness of the apples, and all of the spices. . .way better than a candle! Preheat oven to 350. Lightly spray an 8×8 baking dish with non-stick cooking spray. In a small saucepan, melt butter over medium heat stirring occasionally to prevent scorching. Continue cooking until butter turns light golden brown. Set aside to cool. In a medium bowl, whisk together flour, cinnamon baking powder, baking soda, nutmeg, allspice, salt, and ginger. In a large bowl, whisk together maple syrup, yogurt, milk, eggs, and vanilla extract. Stir in dry ingredients to wet ingredients just until combined. Stir in cooled brown butter until well combined. Gently stir in chopped apples. Spread batter into prepared baking dish. Bake for 25-35 minutes or until just starting to turn light golden brown and toothpick inserted into the center comes out clean. Stir together all ingredients for glaze until smooth. Drizzle over the top of the cake. Allow glaze to set and serve. This recipe is linked with Crazy Sweet Tuesday, Mix It Up Monday, Mop It Up Monday, Nifty Thrifty Things, Pin It Thursday, Strut Your Stuff Saturday, Sweet Treats and Swanky Stuff, Thursday Treasures, Trick or Treat Tuesday, Tuesday Talent Show, Weekend Potluck. haha heck yea this is better than the candle 🙂 I love that this is guilt free! means I get to have that extra piece…. Love the sound of this cake! I could probably eat the whole thing myself… in one sitting… and I shouldn’t feel bad about that right? Haha. Love your new home too! So pretty! No guilt whatsoever! 🙂 Thanks, Kelsey! I agree, every day should be a brown butter day! Thanks, Kayle! Love the new site! and this snack cake…! anything involving cake as a snack has my heart. Thanks, Jennie! Next time I make it, I’ll let you know and we can snack away together! Thanks, Bec! You’re so sweet! I swear by brown butter! It seriously takes baked goods to a whole other level. Nutty, caramelly, and almost butterscotch-tasting. 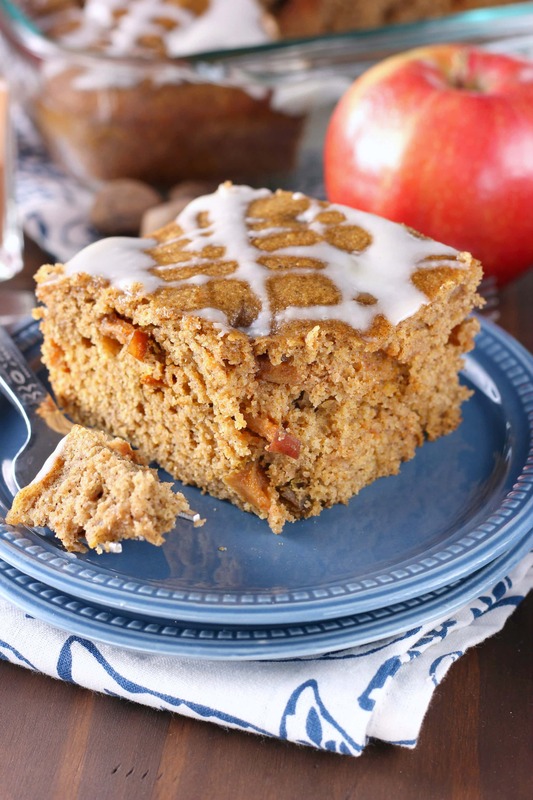 The combination of it with apples in a little snack cake… perfect. Just perfect! Oh, YUM! Love the addition of brown butter – this sounds absolutely fabulous! Love the new site! it looks fantastic, congratulations!!! The cake looks pretty darned good too!! This looks delicious! And, I love your new site — congrats! Oooh, fancy new site!! Congrats on the move – everything looks great!! Thank you, Angela! So far there haven’t been too many glitches! Love this recipe, and the new blog design!! I’m leaving blogger in the next couple weeks too!! Thanks, Elizabeth! I hope everything goes smoothly for you! Can’t wait to see your new site! Absolutely love the new site, Jessica! I am always in when brown butter is involved. Love this cake! AND delicious cake! agh, it’s like adorable overload. Oooh, I love the new site design. And this cake sounds delicious! I love that it’s full of healthy ingredients. Can’t wait to try it! Thanks, Emily! I hope you give it a try! I love the new design! And this cake looks awesome. Brown butter is always a good thing! Looks delicious! Love the new blog! I love all the fall recipes you have been making!!! Thanks, Rina! I’m glad you aren’t sick of them! I love all things fall! I love the term “Snack Cake”…for me that’s code for “eat whenever you want”! This cake looks delicious!! You’ll have to stop by and link this up at our collaborative ‘Iron Chef Mom’ this coming Tuesday because our featured ingredient is APPLES! This week it will be at cheeriosandlattes.com. Love your new look! Thanks for linking up with Mop It Up Monday! Brown butter makes everything better. Love it with apples. What a fun new blog design!!! 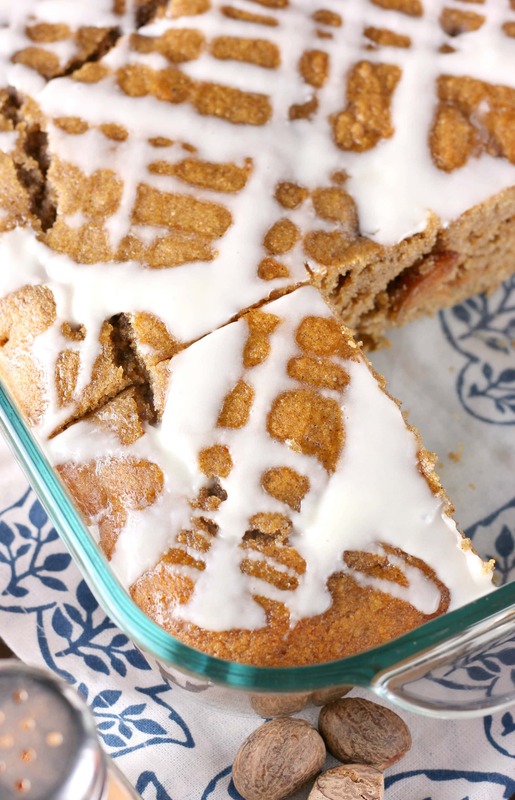 And brown butter and apples in a cake…holy yum!!! Brown butter just adds so much flavor to recipes!! !